This past Thursday and Friday, August 21 and 22, I attended a leadership training seminar led by Dr. Dean Radtke of The Institute of Ministry Management and Leadership. 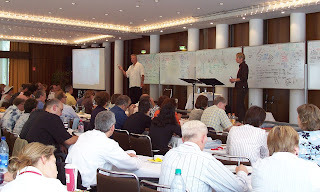 Dr. Radtke travels all over the world holding workshops for pastors and ministry leaders to help them develop their overall leadership skills. In the past I have attended this same "CEO and Leaders Workshop", as Dr. Radtke calls it, but I believe that teaching about leadership and effectively working with people is something that needs to be heard over and over again. As a minister and a missionary I strongly believe in continued training and education along the lines of ministry and leadership to help me stay sharp and so that I can continue to grow and develop in these areas. On the left is a picture from the workshop that just took place here. Approximately 85 people from Germany, France, The Netherlands, Poland, Switzerland, and The United Kingdom participated in these meetings that we at RHEMA Germany hosted for Dr. Radtke. There is a lot of work that goes into holding a series of meetings like this but it is well worth the effort. This leadership seminar was a benefit to me personally and by being involved with the work of hosting this seminar, and in that way having a small part in helping train and develop pastors and leaders, this also helps me fulfill the calling that God has for my life. If you are a pastor or ministry leader I would definitely recommend attending one of these workshops. 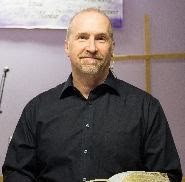 More information about Dr. Radtke's ministry can be found on his website at http://www.ministryinstitute.org/ and you can also find a schedule of his upcoming meetings there.